From the 1st July 2015 Google will be upgrading ALL destination URLs in Adwords, and using what they call a Final URL instead. This is something that will happen automatically, and all that needs to be done in the meantime is for any policy infractions to be addressed before the upgrade happens. A destination URL or landing page is the address of your site that people reach when they click on one of your ads. What are destination URLs used for? Until now, AdWords ad and keyword tracking relied solely on the destination URL, which is made up of landing page URL & tracking parameters. To adjust the tracking parameters, which involves updating the destination URLs, the ads would essentially reset and be sent back for review, and your ads would not run until they had been approved. The upgrade splits the destination URL into two parts, which means that you can enter the landing page part of the URL and the tracking information separately! And even better, if you change your tracking parameters at any level (except the ad level) it won’t trigger a review and the ads will not stop running. Plus, you can update your tracking at account/campaign or ad group level, without seeing your ad stats disappear. Hurrah! Ad final URLs will now need to match the domain of your display URL, or your ad may be disapproved. Your final URL can still contain redirects within that domain. 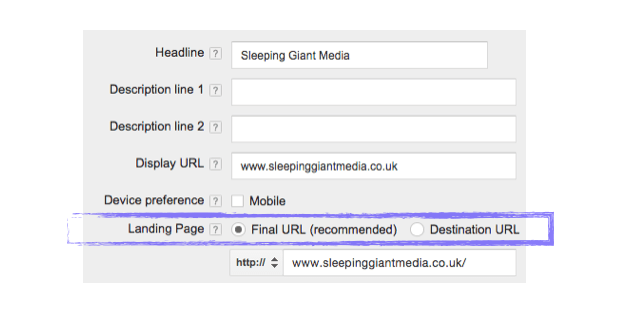 The “Destination URL” column will be renamed to “Final URL” in your AdWords reports. Manual Upgrade: you can upgrade manually campaign by campaign whilst working through any potential issues that could cause your ads to be disapproved. Automatic upgrade: you do nothing and get upgraded on the 1st July. Leaving it to change automatically does bring potential risks if you use tracking parameters. If there any issues that are against the new guidelines your ads will be disapproved, and therefore will not run. Don’t worry, it is not difficult to fix, you just need to know what to look for. You use a tracking template (e.g. ads point to one domain for tracking but the user is redirected and lands on a different domain). We are working with Google and the system that is being used is currently being upgraded, and should run smoother from Monday 29th June. Update: June 30th 2015 – Google have updated the way the upgrade will work. In the previous version any errors in the account would cause the upgrade to be suspended for the whole account. Google have updated this so that any element with errors cannot be upgraded but other elements will continue to upgrade. For elements that do not upgrade they will be “suspended” meaning they cannot be changed (paused, deleted or optimised in any way), although this can be done by speaking to your account support team. These latest changes make the transition a lot more manageable, so if you still have errors or are unsure do not worry. It will be important to find any errors and if they are important elements speak to your account team. We will keep this blog updated as we hear more. Update: July 6th 2015 – The automated upgrade happened nearly a week ago. Wow time flies. The process of addressing errors before has meant that the transition has gone very smoothly for us. We are interested to hear how it has gone for you. Let us know by emailing hello@sleepinggiantmedia.co.uk or leaving a reply below. Make sure you’ve subscribed to our YouTube channel for more digital marketing related videos, and please be sure to contact us if you need any assistance with the final destination URL upgrades.